Nvidia's latest mid-range card is aimed squarely at those gamers and PC builders looking for the most bang for their buck, with the latest cards to be priced squarely in midrange. Nvidia is talking up the 'monster tessellation performance' of four times better that competing GPUs, as well as a huge focus on making this a great card for taking advantage of DirectX 11. "Built from the ground up for DirectX 11 tessellation, GeForce GTX 460 GPUs deliver monster tessellation performance with up to 4x tessellation performance over competing GPUs," states Nvidia. "The GTX 460 brings the ultimate next-generation DX11 gaming experience to a new price segment, enabling more gamers than ever to experience incredibly detailed characters, terrain and game environments with blazing fast performance and awesome visuals. "With full support for Nvidia 3D Vision technology, the GeForce GTX 460 provides the graphics horsepower and video bandwidth needed to experience games and high definition Blu-ray movies in eye-popping stereoscopic 3D." 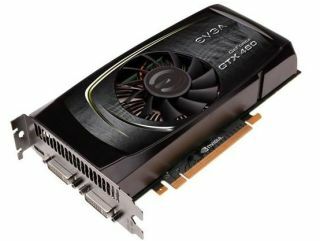 As you may imagine, a veritable flood of graphics cards that use the GPU will be flooding the market from the leading manufacturers.